Jane West the Movable Cowgirl by Marx! The secret behind the success of the 1960s and 70s Best of the West action figures was surely the loving attention to detail which toy makers Louis Marx & Co. lavished upon its flagship line. Cast in solid poly-plastic with vinyl accessories, the most striking thing about these figures today is the exquisite molding – every last fold and crease, shirt cuff, trim and button, is faithfully reproduced, with each figure issued with, quite literally, dozens of individual pieces of equipment and clothing. Launched in 1965 with cowboy Johnny West, the head of what would become an entire extended Western family, at 12 inches in height the Best of the West series was a clear response to competitor Hasbro's G. I. Joe (aka Action Man) “dolls for boys”, which had recently appeared on the market demonstrating that there was an untapped demand for this type of “action figure”. In 1966 a cowgirl to join cowboy Johnny was issued - Jane West. 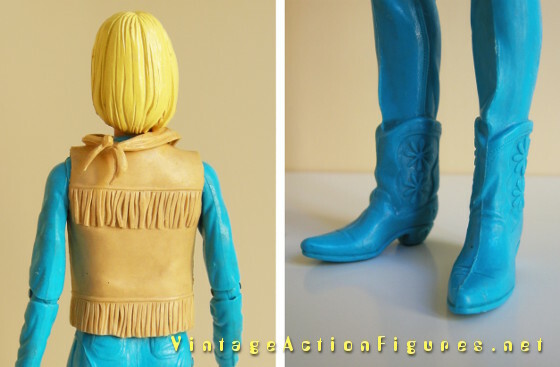 Slightly shorter than Johnny at 11 inches tall, she is still a tall gal – Jane West IS big leggy – and is a striking figure cast in turquoise, with blonde hair. She is date stamped 1965 on her back, although production of Jane West would continue right through until 1975. This version, however, would seem to be an early example, as she has the first of two different versions of her head. Early on in production Marx changed this chunkier face for a thinner, rather more delicate and slightly “prettier” version. I am, of course, delighted, to have my “sensible” Jane instead! I love her Cleopatra-style 1960s eye-liner, although as with all Marx figures, the paint on the face is the only negative point and is daubed on rather sloppily. Poor Jane...I guess putting on Elizabeth Taylor-style make-up was probably tricky when out on the range...! The packaging made a big deal of her articulation boasting not only that she was “fully jointed”, but that she could sit, stand, ride a horse, and also, kneel, indeed “pose for you 1001 different ways!” Sales hype aside, she does have a respectable 11 points of articulation at the neck, shoulders, elbows, wrists, hips and knees, with the hands cast in a softer rubbery vinyl allowing her to easily hold any of the 12 dark brown plastic accessories – including items as varied as a Peacemaker pistol, coffee pot and frying pan. She also had a staggering 22 soft vinyl clothing accessories cast in a light, cream colour – a variety of hats, belts, holsters, skirts and a couple of waistcoats. 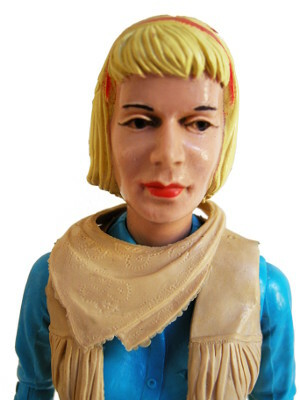 My Jane still has her tasselled buckskin waistcoat (or vest as it seems to be called on US packaging) and neckerchief, both of which are beautifully detailed. The fact that she has lost her skirts pleases me enormously. If I'd owned her as a child I would almost certainly have removed them straight away and preferred the jeans look she's sporting today. Louis Marx action figures are quickly becoming some of my favourites. 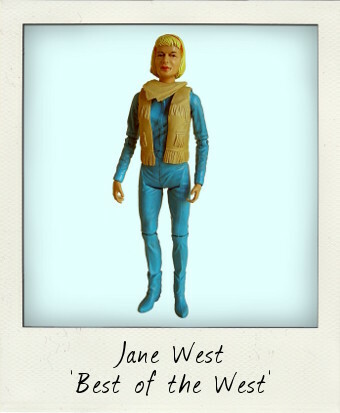 Almost fifty years since manufacture this Jane West figure is still in amazing condition - satisfyingly heavy, easy to pose and display, with all joints stiff and no rust on any of the hinges, she's a wonderful find.